REDWOOD (GB) (Bay or Brown 2006-Stud 2012). 4 wins-1 at 2-from 1m to 1½m, Woodbine Northern Dancer Turf S., Gr.1. Sire of 54 rnrs, 22 wnrs, inc. SW Romancer (ARC Mufhasa S., L), SP Rising Red, Rosewood, Swampland, High Mode and of Chamalu, Night's Watch, I See Red, The Big Sur, Cedar Grande, Dashper, Black Thorn, Livin' on a Prayer, Our Sequoia, Red Sierra, Scarlet Princess, Sequoia Lady, Soonbaby, Suliman, Tamarack, Wooden Red, etc. RAFFAELLA, by Duelled. Winner at 2200m in NZ. Half-sister to BELLA RENZA. This is her first foal. Call Nine One One. 2 wins at 2000m, 2200m to 2016-17 in Aust. Torricella. 7 wins from 1400m to 1600m, Levin RC Kapiti News H., 2d CJC Blue Star Taxis H., Manawatu RC Wenham Grain & Seed H., 3d ARC Celebrating Petty Cury H., BOP RC Dominator Garage Doors H.
Almosfamous. 7 wins from 1400m to 1800m, 1,925Rgt., S$241,980, Singapore TC Benchmark 81 H., Benchmark 67 H., Class 4 H.-3 times, Benchmark 62 H., Benchmark 48 H., 2d Singapore TC Class 4 H., Selangor Turf Club Trophy, Benchmark 53 H., 3d Singapore TC Class 3 H., Class 4 H.
TIO ROSSA (Testa Rossa). 5 wins-1 at 2-from 1200m to 2100m, A$329,897, TRC Strutt S., L, MVRC Moreton Hire H., Ready Workforce H., Valley Events H., 2d MRC Midnight Fever 2YO H., MVRC Essendon Chrysler H., VRC Community Raceday 2YO H., Spotless H., 3d MRC Yalumba H.
THE TIGER (Catbird). 4 wins from 1500m to 2200m, A$262,875, Geelong Classic, L, MVRC Leslie Short Hiskens H., Essendon Hyundai H., 2d MVRC Bingham Freight Systems H., MRC St Razzle H., SAJC Caroma H., 3d MRC Alan Pedley H., 4th Mornington Cup, L.
Onalar (Latarmiss). 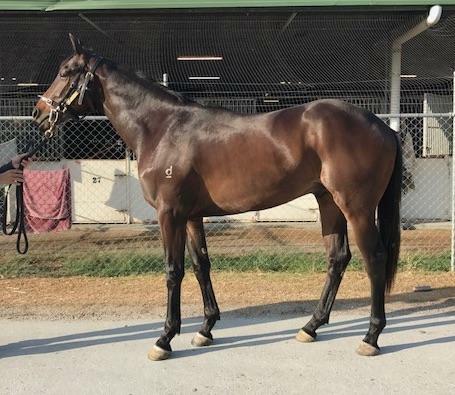 13 wins from 1200m to 2200m, A$339,700, BRC Volvo Australia H., Cisco H., Rockhampton JC Newmarket H., BTC Call 136255 H., Optus Business Direct H., Mackay TC Newmarket H., 2d Cairns Cup, BTC Stoddart Steel House Frames H., Mackay TC Newmarket H., QTC Merlo Coffee H., 3d BRC Dr John Power H., L, Schweppervesence H., QTC Romantic Dream H., T Connor Amor de Mi Vida H.
BELLE DU JOUR (Dehere). Champion 2YO Filly in Australia in 1999-2000. Champion Older Female Sprinter in Ireland in 2003. 9 wins-4 at 2-to 1300m, €16,502, A$2,997,830, 368,000Dhs, STC Golden Slipper S., Gr.1, VRC Newmarket H., Gr.1, STC Reisling Slipper Trial S., Gr.2, VRC Emirates Classic S., Gr.2, AJC Kindergarten S., Gr.3, VRC Gilgai S., Gr.3, 2d AJC Expressway S., Gr.2, 3d STC Coolmore Classic, Gr.1, AJC Light Fingers S., Gr.2, STC Theo Marks H., Gr.2, Queen of the Turf S., Gr.2, VRC Emirates Classic S., Gr.2. DUCCIO - TURQUOISE POWER (Mac.) (More Than Ready). 4 wins from 1500m to 1800m, A$81,850, M$2,102,275, to 2016-17 in Aust. and Macau, Macau Derby, L, 2d ATC Dulcify H., L.
GOLD SYMPHONY (Reward for Effort). 6 wins-1 at 2-to 1400m, A$519,500, to 2016-17, MRC Vain S., Gr.3, HDF McNeil S., Gr.3, ATC Civic S., L, Canberra RC National Sprint H., L.